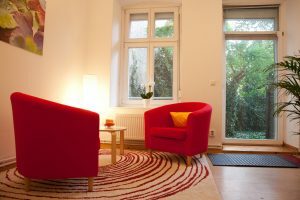 My quiet consultation room with view of a small garden is centrally located in Ackerstraße 168 in Berlin-Mitte. Parking spaces are usually easily available in the area. In this case we can arrange video consultations (e.g. via Skype) and keep in touch regularly even if you are not in the country.